As we look back on the year that is about to go into the history books, I am grateful that Kara was okay after what could have been a catastrophic incident. She was traveling on Interstate 84 in Farmington when she spotted a huge tire truck bouncing across the median. She swerved to avoid it, but it slammed into her car with such force it was nearly totaled. Later, state troopers told her if the tire had hit her SUV head on, well, let’s not talk about it. Troopers Sebastian Cummings and Aaron Pelletier were amazing, as was a Channel 3 viewer named Tina Tiso, who spotted the tire coming off the truck and took a picture. She saw it hit the car and called police. The truck driver pulled over briefly, but then drove away. We’ve never been able to track that truck down. 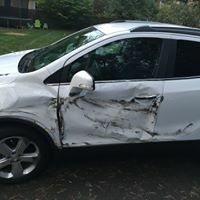 Our Buick Encore was repaired, and we learned a lesson to always stay alert behind the wheel. You can click the pictures to make them bigger. Cannot believe that was back in sept. Seem lik it happened just a few weeks ago. Glad it was just the car and no other injuries.